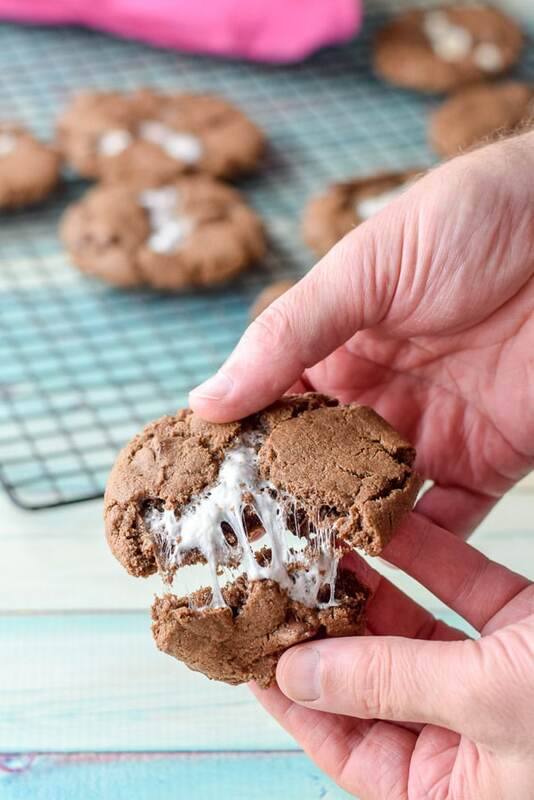 Chocolate cookies filled with gooey marshmallows? 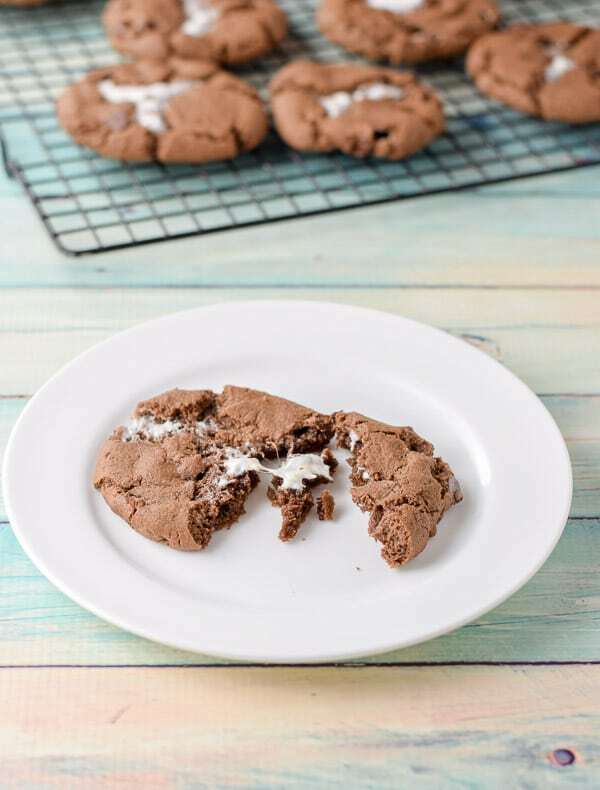 I want this chocolate marshmallow cookie right now!! Don’t you? I mean, look at it! My love for marshmallows goes back a long time. 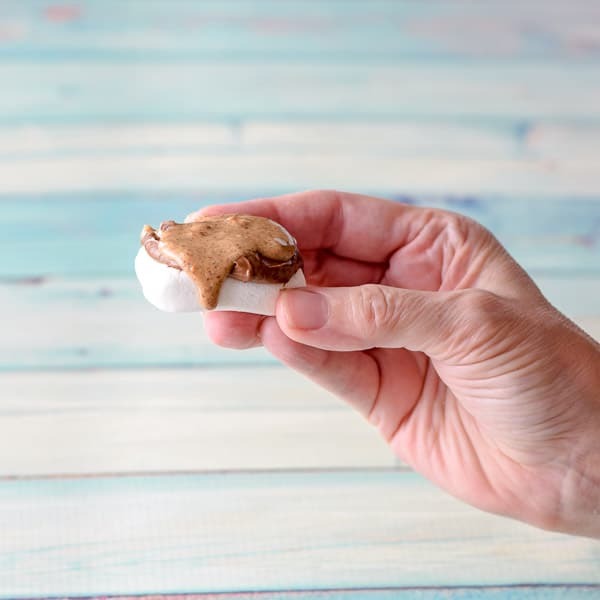 Marshmallows not only go well in s’mores, or s’more granola bars, but also in baked goods like this delicious cookie. Lately, I’ve been devising more ways to serve my beloved marshmallows. Want to see what I did with the marshmallows I bought for this recipe? But first, did you know they now sell squished marshmallows for stacking? So what did I do with them, once I opened the bag? Well, naturally, I popped one into my mouth. I took the stackable out of the bag, slathered it with Nutella and then topped it with almond butter. Now then, back to my memory. One sandwich I wanted all the time growing up, and I mean all the time, was the fluffernutter sandwich. For those of you who don’t know, a fluffernutter is peanut butter and marshmallow fluff (aka marshmallow creme) slathered on white bread. I ate so many of them that my mom used to think I was going to turn into one of those sandwiches. Take out a stick of butter an hour or two before you start. When ready to begin, preheat the oven to 350 degrees Fahrenheit. Take out your mixer, put the softened butter in it with sugar and mix until nice and creamy. Add the egg and vanilla until just incorporated. Do not over mix. 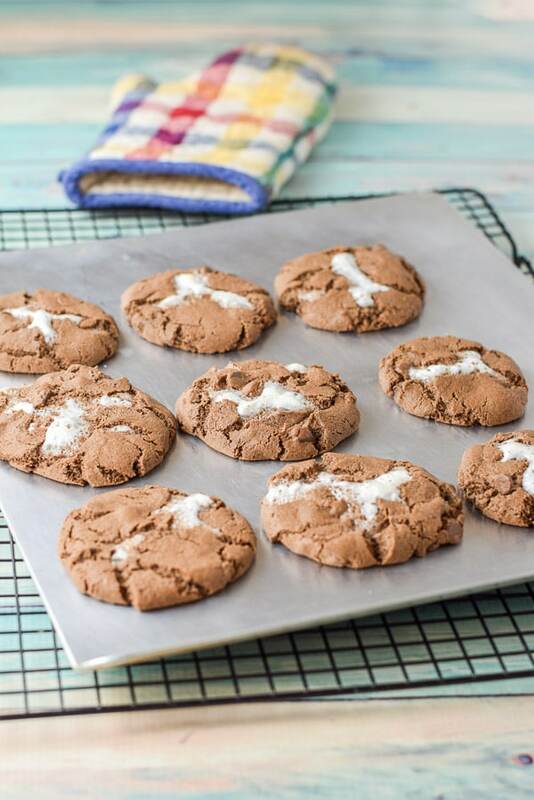 Place a full cookie sheet into the oven and bake the cookies for 15 minutes. Let the cookies cool on the sheet for 5 minutes before gobbling them up. Oops, I mean, remove them from the cookie sheet and place them on the wire rack to completely cool. Let’s see if they look just as delicious at a different angle. Yup, just as I thought. Still looking delicious. Let’s see Christopher break one apart. Now to plate it and eat it. 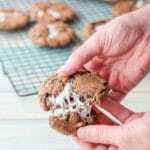 I hope you enjoyed this chocolate marshmallow cookies recipe. 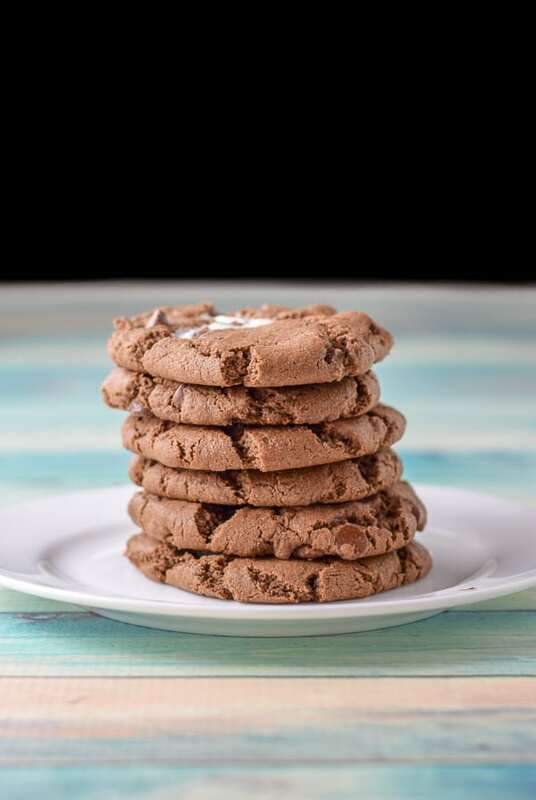 Please feel free to leave me a comment, what is your favorite cookie? 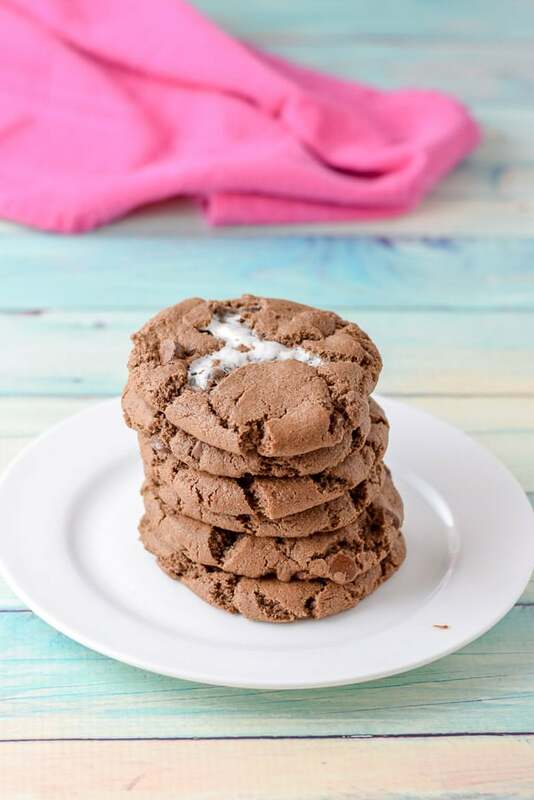 If you’ve tried this chocolate marshmallow cookies recipe, I’d love the know what you thought about it in the comments below. I love hearing from you! You can also FOLLOW ME on FACEBOOK, TWITTER, INSTAGRAM and PINTEREST to see more of my delicious food and delightful cocktails! 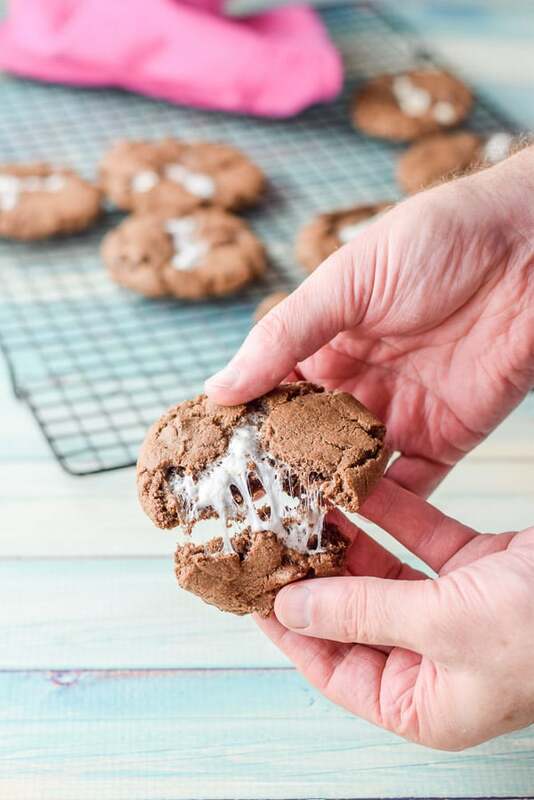 These gooey marshmallow filled cookies are scrumptious! My daughter made these awhile back and they were Delicious!! I helped with the forming of the cookies, but we weren’t able to get the fun crinkles with the marshmallow poking through. I wonder what we should do differently next time. Any suggestions? Oh wow! These sound like such a delicious treat! Would be perfect to bring for Easter brunch! Looks so yummy and easy to make! Brandi! They are super easy! Stackable marshmallows – wow! 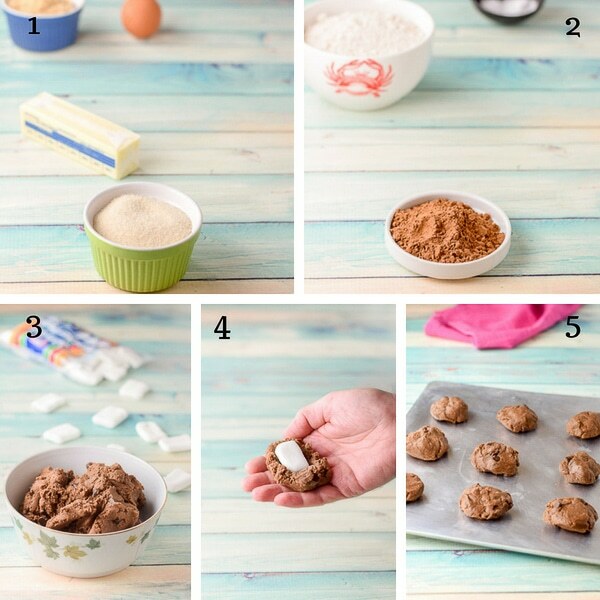 These look so yummy, and that pic with nutella and almond butter, mmm! I love the stackable. They are nice and flat, easier to bake with! Thanks Nicole! Man, these look good! I can’t wait to try them!